I shoot with 18 million-pixel Cannon Digital camera. I cover press conferences, news events and special events. Images of any given event can be emailed or FTP'd to any Internet address within one to three days depending on the quantity of the images and their processing using Adobe Photoshop CS6. 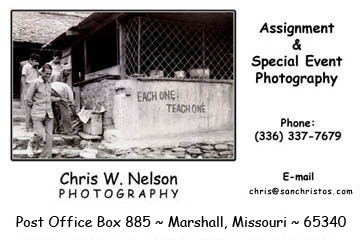 I offer the competitive rate of $750.00 per day (over four hours and less than eight hours) for taking the photos, editing and publishing them on an Internet website , sending them via email or mailing a CD or DVD. I can also work half days. For instance, no more than four hours shooting and editing for a total of $500.00. I usually place client's websites on a "hidden URL" available only to the client for viewing. The advantage of this is that you or your photo editor can view a collection of images without clogging up e-mail with several candidates for publication. From this website, you can then make a print choice. For print prices and sizes see: Outputs and Products.